96 12"x8" Pre-Moistened Washcloths per Tub, 6 Tubs per Case. No unfolding required. Easy single hand dispensing design. 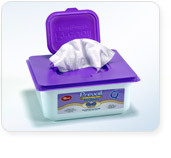 Disposable washcloths are made of strong Spunlace material which is Super Strong and Soft. Cotton Enhanced. Latex Free. Contains Aloe to provide excellent skin care and are alcohol and latex free.